It has been a busy week for gift card deals with 15% off iTunes cards and up to 20% off at Toys R Us, Southwest Airlines, Domino’s and much more. Even IHOP is getting in on the action today with free pancakes. 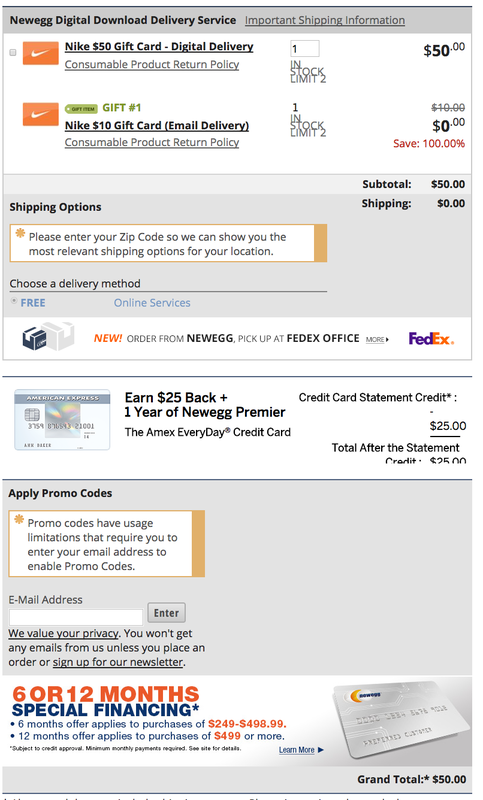 And now, over at Newegg you can grab a $50 Nike Gift Card plus an additional $10 card for just $50 with free email delivery. That’s up to 16% off your next purchase at all Nike locations (NikeTown, NikeFactoryStores, NikeWomen, Nike ClearanceStoes) and Nike.com. In fact, you can grab up to two $50 cards per purchase to get a nice $20 credit. This can be a great way to get even deeper deals on the Nike sales we feature regularly or that next pair of Js you have your eye on. Nike Gift Cards and Nike Digital Gift Cards are redeemable for merchandise at any Nike-owned retail store Locations. (NikeTown, NikeFactoryStores, NikeWomen, Nike ClearanceStoes) in the United States and Puerto Rico and at Nike websites. Orders placed on Nike websites are limited to the 50 United States and District of Columbia. Upon redemption, any unused balance will be carried over for future purchases and will not be redeemed or exchanged for cash, except for MA residents who may request a refund on a credit card if 90% of the value is used, or where required by law. When shopping online, if the order total is more than the gift card amount, the remaining balance must be paid for by credit card. Gift cards will not be replaced if lost or stolen without proper proof of purchase. Sales tax, where applicable, will be applied at the time of redemption. Nike reserves the right to refuse, cancel or hold for review gift cards and orders for suspected fraud, for cards mistakenly issued in an incorrect denomination, or for other violations of gift card policies. Gift cards are available for purchase at Nike.com or at Nike Retail stores. At this time, we are unable to accept or ship international orders. Nike Gift Cards do not expire. Nike.com doesn’t ship to P.O. Boxes, Nike, Converse or Hurley stores for in-store pickup, US territories (Puerto Rico, US Virgin Islands, Guam, Saipan, Midway Islands, American Samoa, and Federated States of Micronesia), International re-shippers or businesses that forward packages or international addresses.